The flat topography of Montmartre gives me vertigo. I understand a dense forest at night, the depth of a chasm, a cliff, the rolling hills, an old cabin in the wood, the bottom of a lake but I don’t understand the vast plains and their flatness. I am lost in a sea of grassland and I am having a crisis of flat-sickness. Words are emerging on the page of my notebook, piling up like little mountains expressing my new giddy obsession; building a mountain. I am annoyed by my own reaction — common, cliché — but the landscape speaks a foreign language. The plains are the antithesis of my personal and imaginary landscape. Every time I dig and search somewhere else for inspiration, I stub my toes on that absent mountain. The throbbing pain pervades my mind. The absent mountain is my aching phantom limb. Most of the first Montmartre settlers were French European urbanites that left the old world in order to start a new life as farmers. The transition into a new continent and lifestyle must have been astounding. Their physical and emotional reaction to the flat land was surely greater than my own. 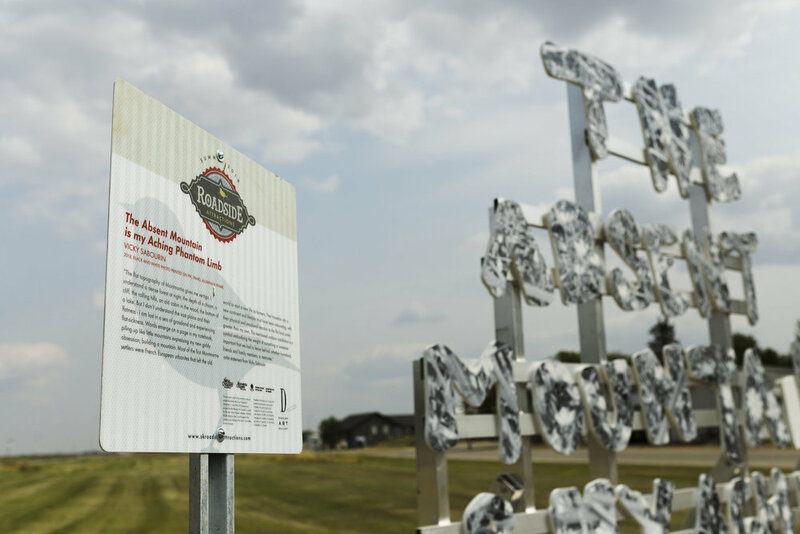 The text-based outdoor installation refers to these settlers or anybody that came from away. The absent mountain is a symbol embodying anything monumental that was left behind. It could be your homeland, friends and family members, memories… It speaks of the weight of something or someone important that we had to leave behind.